Mesa, Arizona, January 9, 2010 – Mesa Regal RV Resort invited USTA Central Arizona out to their beautiful five court tennis facility for a fun filled day of tennis. Over a 150 members of the tennis club participated in the event! The members were divided up into two groups. The first group rotated through four courts of tennis instruction:	serve court, doubles strategies, lob instruction, and volley transition. The second group was introduced to QuickStart tennis, and how this practice format can be used to introduce new players to tennis. The QuickStart curriculum has been a big help in giving new players the tools to be successful in the sport. Each group went through the tennis instruction and QuickStart demonstration. At the completion of the tennis and QuickStart instruction, the members gathered around center court while they watched a mixed doubles exhibition match. 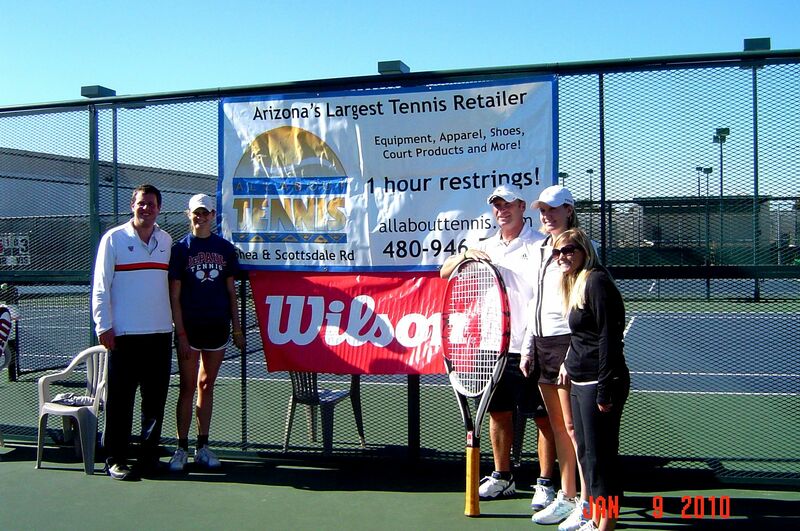 Lauren Colalillo of Wilson Sports, Marcin Pagor, Kelsey Lawson, and Geoffrey Russell, Managing Director of USTA Central Arizona played the exhibition match. Mesa Regal RV Resort is one of about sixteen senior communities in east Mesa that has organized tennis. 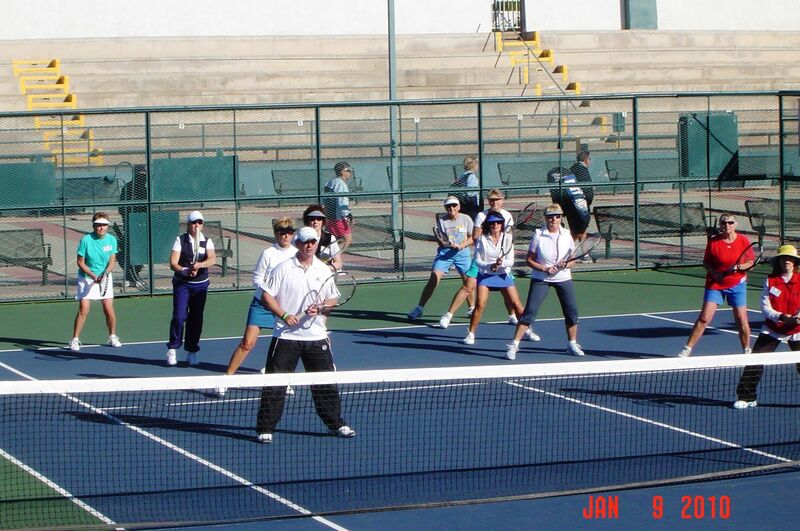 These senior communities all participate in the largest organized senior tennis league in the State of Arizona called the East Valley Senior Tennis League. This is the second fun day that the USTA Central Arizona office has put on with one of the sixteen parks. The goal of these events are to continue to promote and develop the growth of tennis, as well as educate these communities on how the USTA can help them continue to grow their tennis membership. “The tennis fun day went very well indeed. A dozen people asked me: Can we do this again next year?" I hope we are able to do this next year. The lady who won the Wilson racquet in the raffle was ready to give up on tennis, and her husband was extremely worried. Winning that racquet has re-energized her and she is going to being playing again. Fate is an interesting thing,” said Ruth Cohen, organizer of the event. QuickStart tennis is a new play format to help children and adults learn how to play the game of tennis with age and size appropriate equipment. QuickStart tennis includes six specifications, including age, court size, racquet length, ball weight and speed, net height and scoring format. This enables young children and late adopters to practice and play real tennis to scale and allows them to play and learn at the same time—as opposed to the traditional model of learning skills before playing the game. Since rallying and playing is much more fun than standing in line, children will want to continue to learn the game and develop the skills necessary to play with their friends on a team. United States Tennis Association developed the QuickStart curriculum to help make tennis more enjoyable for the kids and late adopters to tennis. What makes tennis fun is being able to rally a ball back and forth over a net with a partner. The sooner the player can rally, the sooner they can actually play the game and participate on a team. The curriculum was designed to give coaches the necessary tools to get people playing the game during their first practice—tools such as simple lead-up activities and ways to modify the court, net, racquets, and balls.